Last weekend I tried to organize a picnic with a group of friends. Unfortunately, the weather didn’t cooperate – it was too cold and we were scared off by threatening rain clouds – so we moved the picnic plans into my living room. For the record, a picnic indoors is still a picnic. Everyone brought finger food to share and there was a growler filled with local beer and lots of lemonade on hand. And one of the best aspects of an indoor picnic? The clean-up was a snap. After everyone left, Cornelius and I loaded the dishwasher, put leftovers in the fridge and then were surprised that our tiny apartment looked so good despite having 10 extra people just 30 minutes earlier. Not too shabby indoor picnic! Now that the weather is nothing short of spectacular – sunshine and warm days ahead, it is the perfect time to head to your favourite park or beach and get in on the picnic action. Instead of sticking with the usual picnic fixings, why not try something new? 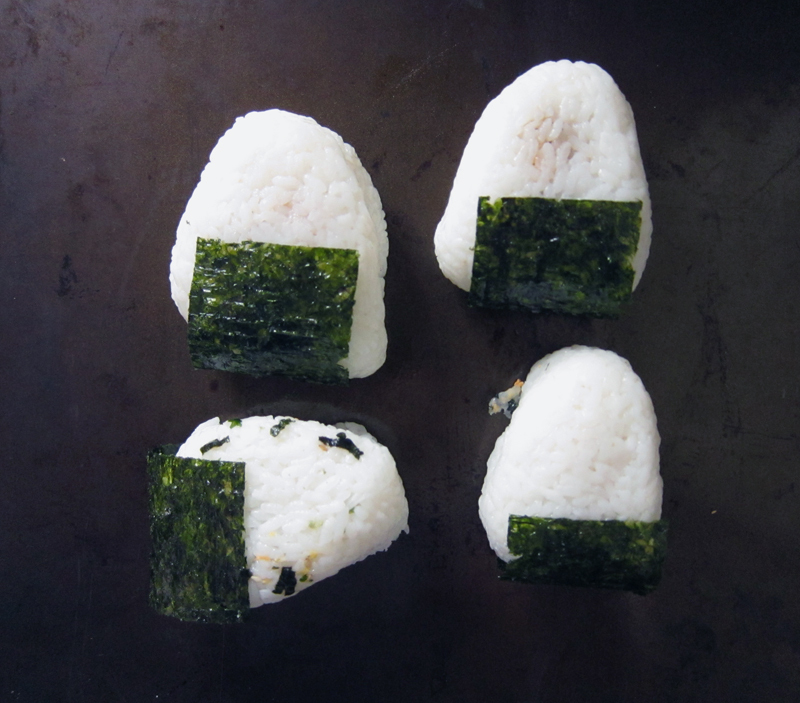 For me, the delicious newness that I’m taking about is onigiri, also known as rice balls. I got the idea from the always amazing Spilled Milk podcast and because I’m woefully behind in my podcast listening, the episode that inspired me is from 2010. My listening habits might be shabby, but this recipe is anything but. They didn’t provide a recipe on the episode but they did provide some handy tips – like using ham as a filling. Yes, ham. Don’t judge, because it’s really tasty. Also, the biggest tip is to use plastic wrap & a small bowl to help shape the rice balls. You can find a detailed description with photos over at Just Hungry and this video with Molly about shaping the rice balls into a traditional triangle shape is helpful too. 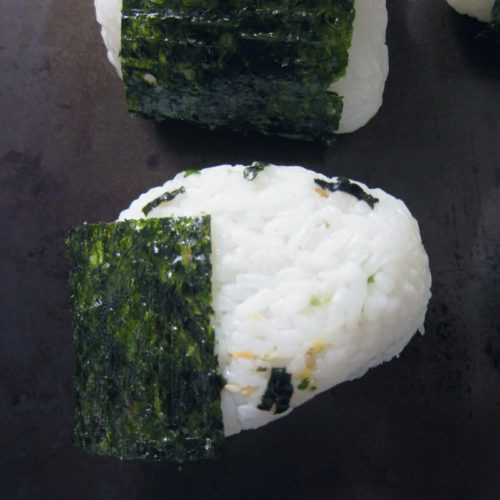 Now that we have the technicalities out of the way, basically onigiri is Japanese sticky rice stuffed with something, preferably salty and then decorated with a strip of delicious salty Korean seaweed. For the picnic, I tried out several fillings: broiled salmon, umeboshi (salted Japanese plums), chicken karaage (deep fried Japanese chicken), pickled vegetables, and yes, black forest ham. I bought some already salted roasted salmon at Fujiya, but you could easily heavily salt a filet of salmon, broil it and then shred it to make your filling. I picked up the prepared chicken karaage so I didn’t have to do anything to it other than chop it up and add in a little bit of extra flavour. What extra flavour? This kind of extra flavour! First off, I dusted almost every filling (except the ham) with the furikake seasoning which is made up of dehydrated vegetables, seaweed, salt, sugar and sesame seeds. I used a vegetarian version, but some versions contain fish so read the labels. It’s rice seasoning, it’s delicious, and it just makes a rice ball taste extra special. The second flavour addition is this not very spicy garlic and chili oil with load of crunchy garlic. It’s official name is Momoya’s Hot So Hot Not Spicy Chili Oil, but you should study the beautiful graphics on the label so you can find it in your local Japanese market. It’s amazing stuff. 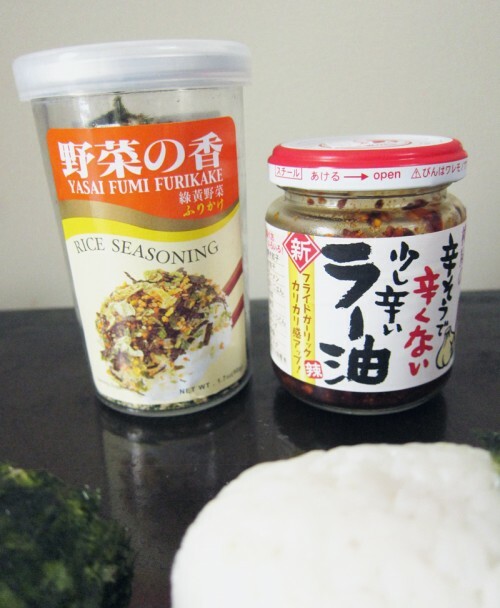 To distinguish the various onigiri at the picnic, I made little signs for each filling, and for the vegetable version, instead of adding the furikake in with the filling, I sprinkled it on the outside of the rice ball for a visual clue. New picnic food, give it a try! Wash the rice very well under running water for a good minute or two until the water runs clear. Add the rice into a medium-sized pot along with 2 1/2 cups of cold water. The magic ratio for Japanese sticky rice is 1 cup rice to 1.25 cups water. Add too much water & you’ll get dough. Cover and bring to a boil, turn down the heat to low and cook for another 6-8 minutes, no peeking! Keep covered, turn off heat and let it sit for 5 minutes. Stir in vinegar, salt and sugar. Take a small bowl and line it with a piece of plastic wrap with lots of overhang. Add a spoonful of rice into the bowl and make a small indent with your finger or the spoon. Tip, use wet hands to keep the mess at a minimum – sticky rice is really, really sticky. Add in a small spoonful of filling, a sprinkle of furakake & some chili-garlic mixture, if using, and then cover with another spoonful of rice, adding a bit more rice if needed to fully cover the filling. Gather the plastic wrap and twist and press the rice using your hands to make a triangle shape (see Molly’s tip in the above post). 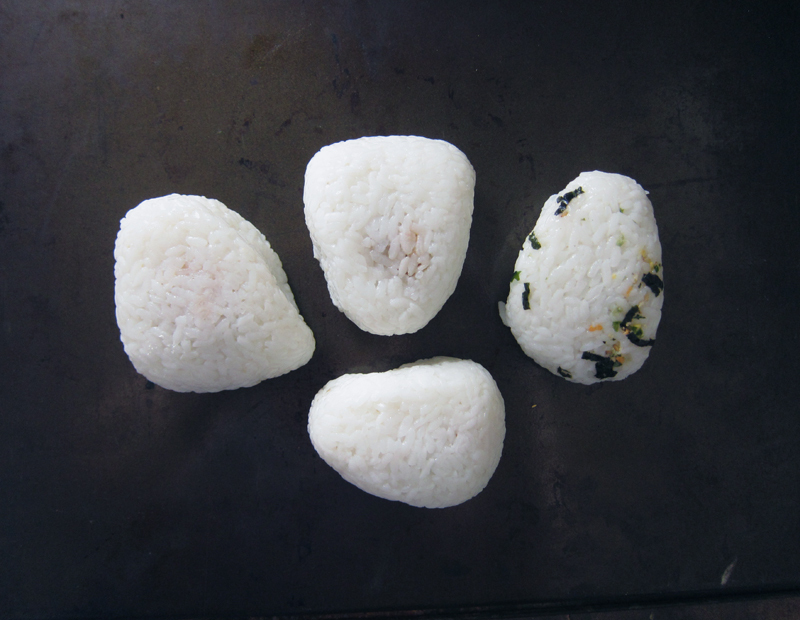 Keep rice ball wrapped if you’re heading to a picnic and continue the process until you’ve got a few rice balls. 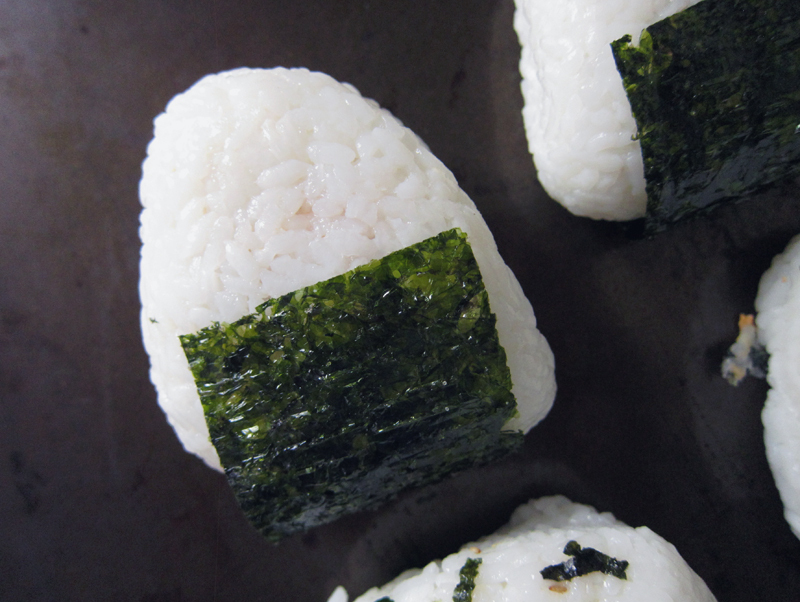 When you’re ready to serve, open up a package of Korean seaweed (I like the kind seasoned only with sesame oil and salt – read the ingredients) and wrap it around the rice ball. Not only does it add nice flavour, it helps keep your hands sticky-free while chowing down. 2 cups of rice should make about 6 onigiri, if memory serves me correctly. Onigiri keeps for a day or two, but no longer. Leftovers can be eaten cold or are delicious panfried until the rice is crispy on all sides. Picnicking is all about the handheld foods and these are the perfect bites! I love that they are kind of out-of-the-box and not your traditional picnic fare. I love these! What a nice idea for a picnic (inside or outside)! I’m glad the weather didn’t spoil your plans and how great that it made cleanup after entertaining so simple. Bonus! Try yakiorigiri — you “fry” the triangle shaped ones in soy sauce. That adds flavor and texture, since it crisps up. Yum! Now I’m hungry for those, too. Thanks Joanne, this is totally a different picnic experience for me and I loved it. Mix it up! LizA, yes, I mention it at the end of the recipe. We reheated the leftovers by frying them up in a little oil, but I like the idea of using soy sauce. Great idea!! Oh these are so cute! What a great idea! I do, on occasion purchase onigiri triangles wrapped in cellophane from an Asian supermarket but it just never occurred to me that you can make them. So excited to give these a whirl!! JoanneM, so delicious to make your own because you can stuff whatever you like on the inside and you know exactly what’s there. 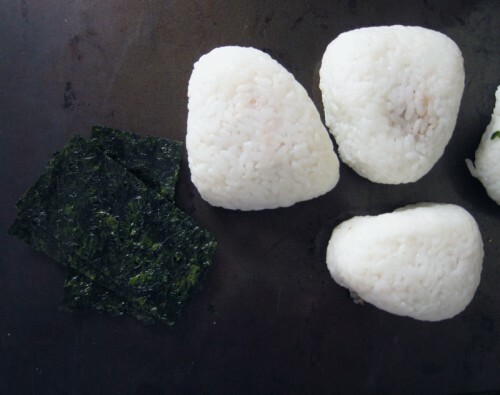 If you’re using plain rice and want a little extra flavor, maybe try a little salt on the outside of your onigiri. Next time you also might try mixing furikake, toasted sesame seeds, or even some finely minced cooked greens into plain rice before assembling your onigiri–with or without filling. There are so many options! Malia, I did want to season the rice so that’s why I added the vinegar, salt and sugar. It also was a little insurance to make sure my rice was sticky enough – though that didn’t seem to be a problem anyway! It was tasty, but you can most certainly leave these out and just salt the outside like you suggest.